Whether you want to track gorillas in Bwindi impenetrable forest or Mgahinga gorilla national parks, Bunyonyi Rock resort is your best guide. We make sure our clients get the very best gorilla encounter experience that last for lifetime. Uganda is home to the highest population of word’s mountain gorillas (over 500 mountain gorillas) hence the best place to cist and track gorillas. Uganda gorilla safaris can be done in Bwindi or Mgahinga gorilla national parks. Bwindi forest is the favorite gorilla destination in Uganda sheltering over 15 gorilla families available for trekking. On the day of trekking gorillas, the driver guide from Bunyonyi rock resort transfers you to the park headquarters of Bwindi/ Mgahinga forest to catch up with pre trekking briefing about the dos and don’ts while with mountain gorillas. In case our clients have hiking challenges, Bunyonyi Rock Resort management can communicate with park management to get our clients the easy to trek gorilla family. Uganda has 17 gorilla families available for trekking every day. These gorilla groups inhabit the jungle of Bwindi and Mgahinga gorilla national parks. Uganda habituated gorilla groups include Mubare gorilla group, Rushegura gorilla family, Habinyanja gorilla group, Nkuringo family, Bweza gorilla group, Busingye family, Katwe family, Christmas family, Oruzogo gorilla group, Bitukura family, kyaguliro group, Nshongi family, Mishaya gorilla family, Kahungye family, and Nyakagyezi. Also Uganda has two gorilla families i.e Bushao and Bikyingi gorilla families which are still undergoing habituation experience. Gorilla safaris to Bwindi are done in four sectors namely, Buhoma sector in the north, Ruhija in east, Rushaga and Nkuringo in the southern part of Bwindi. Mgahinga is home to one Nyakagezi gorilla family. How much is a gorilla permit in Uganda? You must have a valid gorilla permit which is a pass to see mountain gorillas. The costs of gorilla permits in Uganda vary depending on one’s nationality. A single gorilla permit in Uganda costs $600 for foreign non-residents, $500 foreign residents and 250,000 for east African residents. Uganda therefore offer cheap gorilla tours compare to neighboring Rwanda where a single gorilla permit costs $1500 paid by all people including Rwanda nationals. Wondering on how to book for a gorilla permit in Uganda? No worries, engangi safaris help you book and reserve a gorilla permit. Alternatively, you can book for a gorilla permit direct with Uganda Wildlife Authority. Advance booking for gorilla permits is highly recommended to allow timely planning and allocation of gorilla families. Travelers are advised to pay 30% of total gorilla cost as booking fee. If possible hire a porter to help you carry the bags. This helps you to capture nice photos and walk through the bushes with no difficult. Eight people are allowed to see one gorilla family for an hour. The allocation of gorilla groups is done on the actual day of trekking depending on the sector. Each sector has a briefing pint where travelers gather for briefing and gorilla family allocation. Regarding age limit, travelers below 15 years are not allowed to take part in gorilla trekking. Gorilla trekking remains the best wildlife experience in the world. 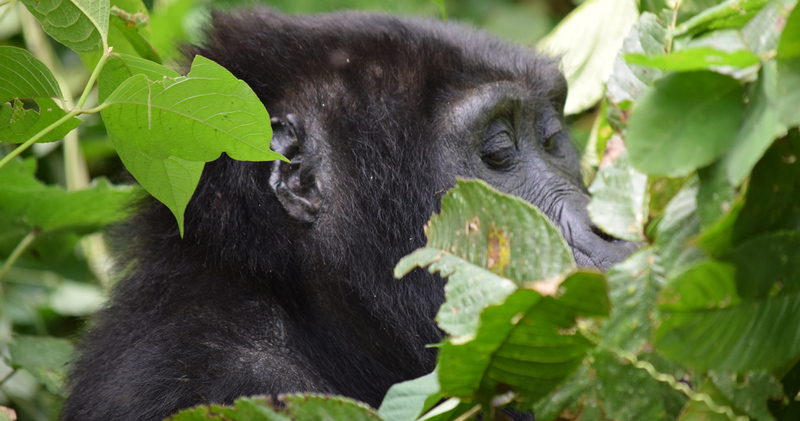 Book a Uganda gorilla tour to Bwindi, meet face to face with the endangered species and embrace the human like characters of mountain gorillas with Engagi safaris.